God’s supernatural power resides in every Christian, but it requires a submitted and sanctified life in order to partake of it. The outworking of that power—the fruit that is produced—is the hallmark of a true disciple. Let’s continue to delve into the empowering aspect of God’s Life. As we said in the last article, the source of all power is God. It’s His saving power, His pardoning power (Matthew 9:6), His infinite power (Matthew 28:18), His power over nature (Luke 8:24), and His life-giving power (John 17:2; John 10:10). For there is no other power but of God (Romans 13:1). Amazingly, a small portion of this immense power is given to every believer by the Holy Spirit at his new birth—it is part of the Life of God that He instills in our hearts. Therefore, this supernatural power resides in every Christian, but it requires a submitted and sanctified life in order to partake of it. Just like God’s Love, it can be quenched and blocked by emotional and “fleshly” choices. However, the outworking of that power—the fruit that is produced—is the hallmark of a true disciple. Let’s review then the ministry of God’s divine power. How exactly does God’s supernatural power work in a believer? 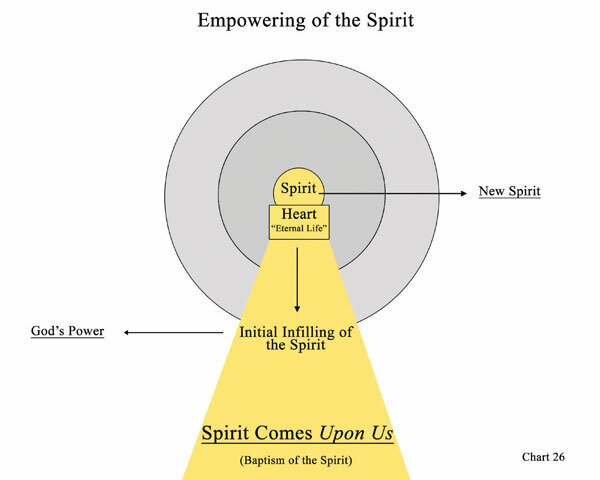 In response to our personal invitation, God’s Spirit of power comes in us (en) and indwells us. This is the time He unites our spirit with His and gives us a brand-new spirit and heart. This is called “the new birth” or being “born again” or “justification.” This is the time when Christ implants His eternal Life––His Love, His wisdom, and His power––in our spirits and hearts, and we become the temple of the Holy Spirit. This is also the time that the Spirit is supposed to come upon us (epi) for the sake of empowering. This is called the “baptism of the Spirit” or the initial infilling of the Spirit (Acts 1:8). Jesus told His disciples: “And behold, I send the promise of My Father upon you. But tarry in the city of Jerusalem until ye be endued with power from on high” (Luke 24:49. See also Matthew 3:11; Acts 1:5). The baptism of the Spirit is God breaking through the soulish and physical realm. 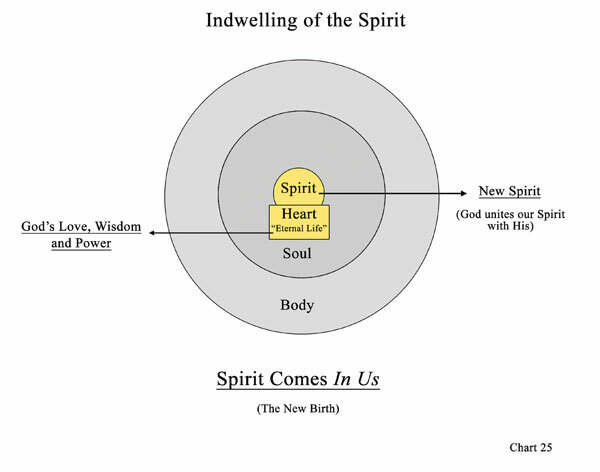 It’s the beginning of our “outer man” (our soul) being subjected to our “spirit man” (our spirit). It’s God’s power to become a genuine witness of Christ, not just in our words, but also in our lives. Without this initial empowering, however, we will be just like believers who have a “form of godliness,” but who “deny the power within” (2 Timothy 3:5). In other words, they know the Scriptures in their heads, but they don’t allow the power of God to come forth and transform their lives. 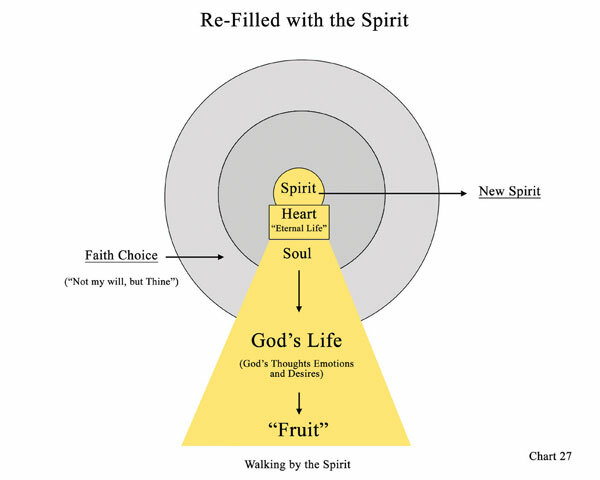 After we have been indwelt and empowered by God’s resurrection power, we must daily be refilled (pleroo) with His Spirit of power from the inside out. “Wherefore be ye not unwise, but understanding what the will of the Lord is, and be not drunk with wine, wherein is excess; but be filled with the Spirit” (Ephesians 5:17–18). This step differs from the first two steps in that it’s now our responsibility (our choice) to stay cleansed and sanctified, so we can be refilled and empowered. This does not happen automatically. It is God’s will, but it is our choice whether or not we do it. This last step is the beginning of the process called sanctification. Having, therefore, these promises, dearly beloved, let us cleanse ourselves from all filthiness of the flesh and spirit, perfecting holiness in the fear of God. Our job is to make the right faith choices. God is the One who empowers us. Consequently it’s imperative that we not stop at the first step of salvation—our justification—but that we go on to the next phase, which is our sanctification. “If we live in the Spirit [if we are born-again], [we must learn to] also walk in the Spirit” (Galatians 5:25. See also Ephesians 5:18). It’s the Spirit of Christ’s resurrection power that not only renews our minds and transforms our lives, but also enables us to walk by His Spirit. The Spirit brings us to Christ and gives us His Life, then He empowers us to reflect Him in all we do. Our job, then, is to stay cleansed, filled, and empowered. But we have this treasure in earthen vessels, that the excellency of the power may be of God, and not of us. We are troubled on every side, yet not distressed; we are perplexed, but not in despair; Persecuted, but not forsaken, cast down, but not destroyed; Always bearing about in the body the dying of the Lord Jesus, [so] that the Life also of Jesus might be made manifest in our body. The Excellency of the power must be of God and not ourselves. God promises us that in the end, He will raise us up by this same power as He did Christ (Romans 8:11). God hath both raised up the Lord, and will also raise up us by His own power.